Lost Children of the Far Islands by Emily Raabe. Review: Do you like mysteries and fantasy? Then you will enjoy the book Lost Children of the Far Islands Emily Raabe. It is a story about three children that go to the Far Islands to save their mother. 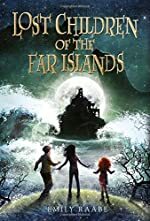 Lost Children of the Far Islands is about twins and their little sister that live in Maine when their mother becomes sick. She becomes sick because she is protecting her children from evil, so they go to the far islands and see their grandmother. Their grandmother is folk, which means that she can turn in to creatures and back to humans just like their mother. Then when the kids get there they have to battle a beast, but however kills the beasts will die. Will the kids make it alive? Lost Children of the Far Islands should be a book for kids in grades 4-6, because it has some big vocabulary and there is a lot going on. So you have to be able to keep up. This book has a great mixture of fantasy and mystery, because the kids have to find out what happens to their mom and what the little sister is trying to say. The fantasy of the book is the way the folk can switch from animals to humans and the other way around. The setting of the book is realistic in the beginning because they are in the normal world and are at their house going to school and being normal people. Then the setting changes to a mysterious place in the wilderness. This is where they met their mother's side of the family. This book would mostly be recommended to a girl. We would like to thank Random House for providing a copy of Lost Children of the Far Islands for this review. Have you read Lost Children of the Far Islands? How would you rate it?